Although he had set all kinds of records for pass-catching at Xavier University (120 catches, 1,685 yards, 14 touchdowns), he was regarded as too “small and slow” by NFL scouts. Selected by the New Orleans Saints – 420th out of 445 players picked in the 1967 NFL draft – Abramowicz parlayed grit and an uncanny ability to catch any ball thrown in his general vicinity into an outstanding nine-year career (1967-1975) as a wide receiver for New Orleans, San Francisco and Buffalo. He enjoyed his greatest success with the Saints, where he led the league in 1969 with 73 receptions for 1,015 yards and set a record for catching at least one pass in 105 consecutive games (1967-1974). He wound up his career with 369 receptions for 5,686 yards and 39 scores. Almost from the start of his life, nothing ever came easy for Danny Abramowicz. Abramowicz, born July 13, 1945, nearly died from a digestive ailment when he was two years old. A diet of goat’s milk and bananas pulled him through. He didn’t bring any spectacular gridiron credentials from Catholic Central High School in Steubenville, Ohio, when he showed up on the Xavier campus. Head coach Ed Biles recalled, “He was never flashy, but he always played with a recklessness that made you worry about his safety. He was the kid who enjoyed staying after practice to work with the quarterback, running patterns and catching the football. “He had to work hard to develop the only God-given talent that he had as a receiver a sure pair of hands. Maybe it was his Polish breeding that provided the drive within him, but whatever it was, Dan was so terrified at the prospect of not playing well, he’d always give you 500 percent. In his junior year, Abramowicz sustained a back injury before a crucial game against Toledo. Biles was under doctor’s orders to use Dan as little as possible. Abramowicz holds Xavier’s career records (the university dropped football in 1973, six years after Dan’s graduation) with 120 catches for 1,685 yards and 14 touchdowns. 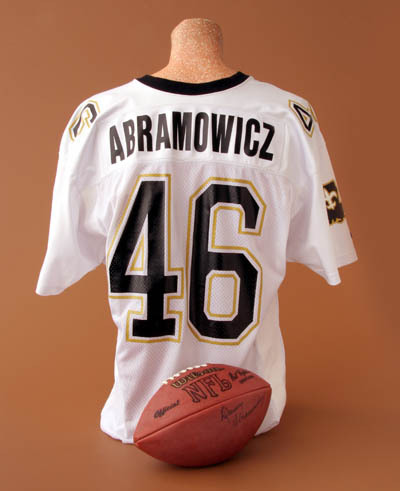 In professional football’s 1967 college draft, Abramowicz, despite setting those pass catching records at Xavier University, was not selected until the 17th (and last) round, the 420th pick out of 445 players pulled from the grab bag that year, and by an expansion team yet, the New Orleans Saints. The pro scouts pegged Dan as “small and slow.” All they could measure was his 6’1″ frame carrying 195 pounds, and his lack of foot speed, rarely doing the 40 yard-dash under five seconds. They couldn’t measure his heart, his determination and his grit. Few expected Dan’s pro football career to last much beyond training camp. Bob Marshall, a sportswriter for the New Orleans State Item Times Picayune, wrote, “Abramowicz was, in fact, all wrong for the job (of wide receiver). NFL receivers were supposed to be sleek athletes with the grace of gazelles and the speed of jaguars; angular figures whose slicing, dancing patterns and beauty of movement bring a breathtaking counterpoint to an occupation in which victory is a measure of bulk and brute strength. Abramowicz caught the eye of the coaching staff and the fancy of Saints fans during the camp and pre-season games as the crazy special teams player, the slow receiver who would do anything to make the team. For the first seven regular-season games, Dan played in obscurity. By midseason, injuries had whittled down the corps of wide receivers. “That left no one else but me, “Abramowicz said. He caught 12 passes in his first start, against Pittsburgh, grabbing everything that came near him. He kept his starting role, ending the season with 50 catches (after only nine in the first six games) for 721 yards and six TDs. The New Orleans Touchdown Club hailed Dan as the Saints’ offensive player of the year. Abramowicz was the Saints’ leading receiver for the first five years of his seven-year career with New Orleans, capped by his league-leading 73 catches for 1,015 yards in 1969. Going into the final game, against Pittsburgh, Abramowicz, Washington’s Charley Taylor, and the Steelers’ Roy Jefferson were tied with 65 catches. Danny caught eight passes to Jefferson’s two to earn top honors. In his nine-year pro career (New Orleans 1967-73, San Francisco 1973-74, Buffalo 1975), Abramowicz missed only one game, the finale of the 1972 season, due to a knee injury. Abramowicz established the NFL record for catching at least one pass in 105 consecutive games, from October 29, 1967 to December 15, 1974. He wound up his career with 369 receptions for 5,686 yards (a 15.4 average) and 39 touchdowns. And Danny made it all look so, so easy. As if there was nothing to it. In his first three seasons as a pro, Dan Abramowicz caught 50, 54 and 73 passes to join an exclusive club of three men at that time who had caught 50 or more passes in each of their first three seasons. The other two were Mike Ditka and Tom Fears. “A receiver can have great hands and be nothing if he can’t concentrate. It sounds easy, but it isn’t. Danny goes after the ball like he’s the only man on the field – just him and the ball. Abramowicz crossed paths with Ditka for the 1992 season as special teams coach for Ditka’s Chicago Bears. By the end of his first season in New Orleans, Abramowicz was canonized a certified Saint, easily the most popular player on the team. He returned the love the fans heaped on him, burying himself in local charity work. He became “Mr. Danny” to an adoring public. He was traded to San Francisco. That same night, he kept a commitment to speak to the team’s booster club, breaking into tears as the audience sang goodbye. Two weeks later, New Orleans visited the 49ers, who cruised to a 40-0 win. Abramowicz caught five passes, including a 55-yard TD bomb. But wounds healed. Abramowicz remained in New Orleans in the off-season and it wasn’t long before “Mr. Danny” could walk the streets again.